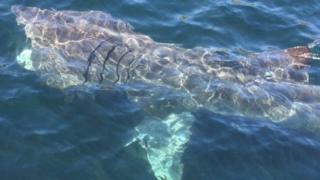 An "incredibly early" sighting of a basking shark has been made off the coast of Cornwall. The 20ft-long (6m) female was photographed on Saturday, near Falmouth, by a boat skipper. The plankton eating creatures - which can weigh up to seven tonnes - are not normally seen in UK waters until the start of May. Higher than average sea temperatures were probably a factor in the early sighting, Cornwall Wildlife Trust said. Captain Keith Leeves - who spotted the shark - said the temperature of 12.9C (55F) was much higher than average for the time of year. "This is an incredibly early sighting and it's always exciting to see them. Normally, we're looking at May to see them arriving," Captain Leeves said. "They only come up when the plankton comes up and having that still, lovely warm, settled period - bless your heart, there was one on the surface," he added. It is not the earliest known sighting of a basking shark in the UK - that was thought to have occurred around 24 March 2011, when a shark was also spotted off Cornwall, thought to have been attracted by an algal bloom. But in recent years there have been fewer sightings of the sharks, Cornwall Wildlife Trust conservation manager Ruth Williams said. "We've had a few really bad years in terms of sightings because although basking sharks are fish, they don't have to come up to the surface. "It may be they're still there feeding but we're just not seeing them," she added.